The Family Manifesto was written to respond to a growing need to define God's timeless principles for the family. It confronts and challenges the popular definitions of a family offered in today's culture. Pastors, church leaders, and lay people need to know the biblical blueprints for building a godly home. 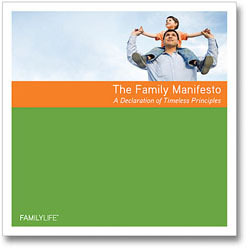 A guiding document for your own family, as well as for other families, The Family Manifesto is long overdue. FamilyLife®’s mission is to build godly marriages and families that will change the world, one home at a time. It expands with our compassion for families in need of help, and for those the Bible calls helpless. Through our conferences, broadcasts, web site, and resources, we are seeing God rewrite the legacies of husbands, wives, and children everywhere.